In 2008, Patrick Wakely started a part-time contract with the GTZ Syrian-German Sustainable Urban Development Programme to help develop a municipal policy and implementation strategy for informal settlements (IS) in Aleppo. This is linked with the development of a broader-based City Development Strategy (CDS) also being assisted by GTZ, (German Agency for Development Co-operation, the implementing agency of the German Ministry for Economic Co-operation), and the Cities Alliance. The early stages of this on-going programme have already raised interesting issues around government, governance, decentralisation and participation in the context of a country in transition to a social market economy and administration at the national, municipal and local levels. dwellings are constructed in contravention of building standards and regulations. settlements that are structurally and environmentally safe but are in contravention of prevailing norms and development control legislation. Eighty percent of the informal settlements fall into categories 2 and 3, the majority of which only need the transfer of title to land (much of it already in public ownership) and official acceptance of their adequate standards of construction, to render them ‘formal’ and legal. 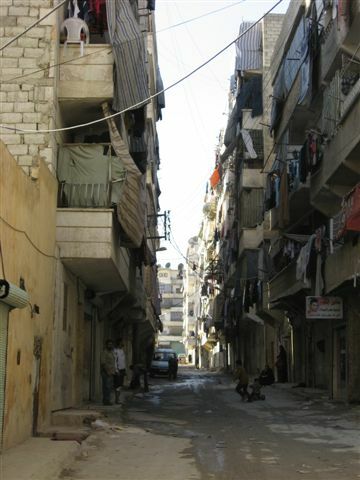 However, despite policy intentions to decentralise such issues as planning and building standards and urban land management1, Syria remains wedded to the centralist principles of state control of urban development and social housing provision, despite persistent evidence that it has neither the technical nor the financial resources to implement them. Within this national political context the city of Aleppo has a reputation for independence and innovation and a strong and progressive mayor2 who is half way through his second and last four-year term of office. His support for the regeneration of the Old City centre, the CDS for the economic development, promotion and marketing of the city and the instigation of a municipal IS policy could have a significant impact on the initiation of change in urban policy at the national level. 1. A ’Rapid Profile’ study of all informal settlements in the city that provides an overview of the history, society, economy, infrastructure, services and environment of each of the 28 IS, giving emphasis to their diversity and a preliminary classification of their conditions, problems, assets and potentials. (This component has been completed and published as an illustrated report in English and Arabic). 2. A study of informal land and property markets in Aleppo, built on the premise that they are efficient and effective in making affordable land and housing accessible to the lowest income groups and concluding with a review of current legislation suggesting how it might be amended in ways that would legalise informal procedures without destroying their commercial and social advantages. (The study was in process in July 2009). 3. The establishment of community organisations in two sample IS neighbourhoods with different social and land tenure conditions to test and demonstrate approaches to decentralised participatory governance. Through a series of focus-group discussions, priority problems are identified and community-centred approaches to resolving them locally are developed in partnership with municipal authorities and other relevant agencies. (This component was in process in July 2009). Underpinning the intentions of these sub-projects is the need to demonstrate that IS are an important component of the city’s housing stock serving almost half its population. The housing and property market is a single continuum within which the classification of ‘informal’ is an artificial construct that, in the minds of many, carries pejorative antisocial overtones as well as those of illegality. The message that they are here to stay is not easy to convey and is made all the more difficult by the entrenched perceptions of the ‘sanctity of the master plan’ and unassailable statutory standards that cannot be afforded. Changing attitudes and perceptions is the most difficult task facing the Steering Committee. It will take time, but it is under way. 2 Dr Maan Chibli, an engineer and urban planner (École Supérieure, University of Paris), Associate Professor of Planning, University of Aleppo.